Disclaimer: Those hairy legs are the result of an optical illusion. Looking down the legs has given the impression I’m wearing a gorilla suit. If I had one I would. It’s freezing out there. My feet are important to me, as is how warm they are, especially on days like this when the temperature has dipped to -15??C. Support, friction reduction, anti-microbial, impact resistance, Moisture management, comfort and of course insulation are all features you can consider. I have a pair of Merino wool & bamboo socks with silver in. You can wear them for days without them smelling. Or so I’m told. 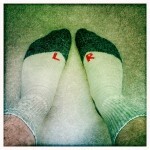 I have lots of pairs of socks so tend to change them daily. But it’s good to know that they are capable of these things. I guess not having smelly feet in a survival situation is a moral thing… Or perhaps animals won’t try to eat you. I’m still waiting for socks designed to catch fish. I did filter water through a sock once. But it wasn’t an advertised feature.